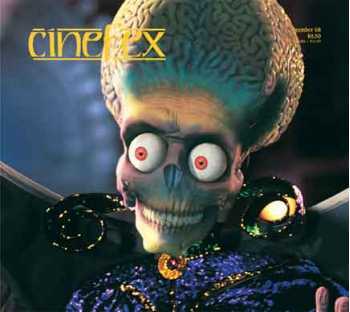 In Mars Attacks!, director Tim Burton's lampoon of the alien invasion genre, hordes of flying saucers and big-headed Martians wreak havoc on earth's inhabitants. Forsaking motion control spaceships and stop-motion creatures in favor of an all-digital approach, Industrial Light & Magic and the newly established Warner Digital Studio shared responsibility for the visual effects. Conceived by Landmark Entertainment as a thrill-packed continuation of the Terminator saga, Terminator 2: Battle Across Time - Universal Studio's newest theme park extravaganza - redefines 3-D and special venue entertainment. Terminator 2 director James Cameron and the film's original cast teamed with effects powerhouse Digital Domain to bring the groundbreaking project to fruition.